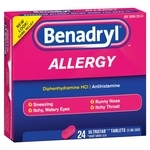 I had taken Benadryl Allergy medicine for years and was looking for a less expensive option. I relied heavily on the sleep-inducing properties of Benadryl and was hoping for the same effect from Equate Allergy & Sinus Relief Tablets. I was sadly disappointed. During a sever allergy attack, I took two of these tablets and did not experience any relief. Several hours later, according to the instructions, I took two more tablets but did not notice a reduction in my symptoms. I suffer from seasonal allergies as well as some specific ones, including hay fever, animal dander and pollen. I wish that the Equate brand would have worked for me since it is a much less expensive option. I guess you get what you pay for. Effectiveness Did not relieve my allergies or help me sleep. I was still just as congested as before. Ease of Use Directions are clear and easy to follow. Immediacy I never experienced any relief with the Equate brand of allergy medicine. Works great and sells at a bargain price! I get seasonal allergies and my son seems to suffer with sinus problems all year round. 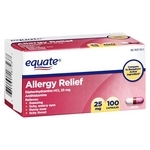 Equate Allergy & Sinus Relief Tablets are a great alternative to Benadryl. The active ingredients are the same and I save a considerable amount of money buying this cheaper version. They seem to work the same to me. Effectiveness This combats allergy and sinus symptoms caused by a variety of things such as bee stings and bug bites, pollen, dust, etc. This does a great job of clearing my sinuses so I can breathe easy again. It also will take away rashes and reactions I may be having. Ease of Use These tablets are small and easy to take. My son likes these because of their small size also. We both have problems swallowing large pills. I suggest taking with a lot of water because they tend to dehydrate me. They can also make me drowsy but not to the point where I can't stay awake. Immediacy These pills tend to start working in about twenty to thirty minutes. I purchased the Equate Allergy & Sinus Relief Tablets instead of the name brand equivalent because it was more cost effective. I like that each tablet is separate in a blister pack foil package. The box is easy to open. The tablets are easy to remove one by one from the package. I did not encounter any accidental opening of an adjacent tablet. I did find it was a little difficult to slide the remaining tablets back into the box after removing the tablets I needed. The plastic covering half the tablet was not smooth and caused it to catch on the box. The design of the packaging keeps the tablets dry. I found this product to be very easy to take with me where ever I went. The tablets are easy to swallow. The effectiveness of the tablets depended on the severity of my sinus and allergy situation. For the most part, on most days that I needed to use this medicine, It cleared up my allergy symptoms and relieved my sinus pressure. I used the Equate Allergy & Sinus Relief Tablets only a few times. I have severe allergies and chronic sinusitis, meaning I get frequent sinus infections. It has always been a battle getting my seasonal allergies under control. I also struggle with opening up my sinuses on a daily practice. Effectiveness I do not think that this medication was very effective at all because it did not stop all of my symptoms in the slightest, and what little did work would wear off before you were allowed to take another pill. Ease of Use These are pills that are tiny, making them easy to consume each time you need to take a dose. The problem, however, is that they need be taken a few times a day, which makes it very difficult if you are out running errands; you need to remember to take the bottle with you or a few pills, otherwise your allergies will kick in almost immediately after the allotted time runs out. Immediacy While the medication does not kick in immediately after you take the pill, it sure stops working as soon as the allotted time of expiration runs out. Equate Allergy and Sinus relief is just as good as Brand name allergy relief products! 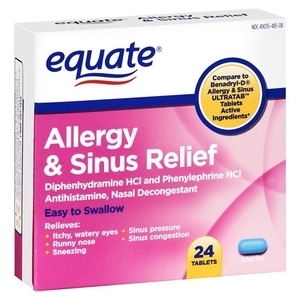 Equate Sinus and Allergy Relief clears my sinus, stops my watery and itchy eyes from tearing and itching. The only thing i do not like about Equate Allergy and Sinus Relief is the packaging. I prefer bottles. The bubble packaging o this box of Equate Sinus and Allergy Relief is almost impossible to open! I usually have to use a sissors and it is very difficult.I would definately recommend this product but in a different package! Effectiveness This product is as effective as a brand name product at a fraction of the cost! Ease of Use The packaging of Equate Allegry and Sinus Relief is pracitcally impossible to open. I would not recommend buying this product in a box with this type of packaging. Anyone with arthritis would not be able to open it at ll! Immediacy Equate Allergy and Sinus relief works as at as brand name products of the same type. 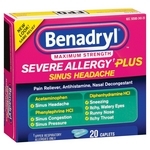 I decided to purchase Equates brand of allergy and sinus relief in comparison to Benadryl. The price was considerably lower which caught my eye and the pills are also pink like Benadryl tablets. I have pretty extreme allergies, year round with no off season so I want to try as many different products as I can to find the right one for me. I would say though that for this specific product it left me in search of something a little more. For those with less severe allergies this would probably be an ideal product nonetheless and for a reasonable pride as well. Effectiveness As mentioned, my allergies would be classified as severe so for me personally even taking two at a time over the course of six hour periods, I was still moderately stuffed up and my sinuses were unable to fully clear. Ease of Use One thing I did actually like about Equates allergy pills is that they're a rather small pill, quite easy to take. When I found the Equate Allergy & Sinus Relief Tablets at the price I found them I had to give them a try. I was very pleased with the product and it's effectiveness. I had always used the name brand up until now, but upon discovery of this product I have permanently changed to this product. In using both the name brand and this product I have noticed absolutely no difference in the products except the pricing. I also like the packaging more so than the bottles that the leading brand is packaged in. I feel like the individually packed pills seem to be fresher and easier to retrieve from the packaging, for arthritic hands such as mine. I would and have recommended this product to many of my friends and relatives as a great way to save a little cash each month, since we almost all use a product of this type. I will forever be loyal to this brand unless it happens to be out of stock. 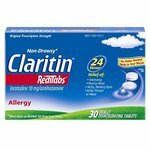 I really feel like I have found one of shopping's great secrets in the Equate Allergy & Sinus Relief Tablets. I wanted to try a cheaper alternative to Benadryl since my allergies flare up quite often in the Spring. The Equate allergy pill has been a great alternative and has worked very well at helping my allergies stay under control. I really haven't been able to see a difference between the Equate brand and the Benadryl brand so I much prefer to go the cheaper route. The active ingredients are the same which can easily be identified on the package. This pill did cause drowsiness for me so be aware that this happens to a lot of people. When I have severe congestion I like take something that is a bit higher of a dose but that would go beyond what Benadryl would offer in this comparable pill type. Ease of Use Very easy pill to swallow with water. It is small and doesn't have rough edges. Immediacy It takes a little bit for the pill to kick in since it isn't a gel pill form but I can definitely feel it working within thirty minutes. This product works exactly like the leading name brand antihistamine for half the price. I have used it several times with great results. I suffer from extreme seasonal allergies and sometimes I need an extra histamine on top of my regular allergy medication. This pill does the trick! Effectiveness works quickly and effectively with just one dose. I have a severe allergy to ragweed and from time to time suffer from the effects of itchy eyes and swollen facial features. This product eases all of those symptoms quickly. I have never had an issue with the dosage. Ease of Use easy to swallow tablets are small and coated. The product does make you drowsy, as does any histamine, so you want to be careful when taking this during the day. Immediacy Product works as indicated and lasts for promised time. Have never needed to up the dosage. I have always been satisfied with the results I get from this product. This is Walmart's version of Benadryl. I find it as effective as the brand name, at a much lower cost. The pills are a very bright pink color, which is slightly offputting. As with the name brand version, the Equate brand side effects include drowsiness. Sometimes this can be severe, especially if you take more than one tablet. I find that it also is dehydrating, so it's best taken with a lot of water. 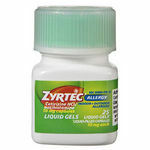 Effectiveness This product is extremely effective against allergic responses to things ranging from pollen, mold and dust to bee stings and mosquito bites. I use it frequently when I have rashes on my arms from working in the garden without sleeves or after mowing the yard. Occasionally, I will take it before exposure to help head off potential reactions. Ease of Use These tablets are small and easy to swallow. They are also easy to break in half if you don't want an entire dose, or if you want to give a dose to a child. Immediacy I usually begin to feel relief within twenty minutes or so of taking this medication. The effects last for hours.